Took some time today to get some of my new Tim Holtz stamps inky. He is so right about Black Soot being a pure black ink. See how well it stamps here. All of these are his stamps, his Distress Inks and my ribbon! HA! Just a bit of fun on a piece of Graphic 45 paper background. Everybody hang in there....the going has been tough! This is the technique we will learn at Scrapbook Friend'z on Oct. 12th in Bloomington. Come join the fun and learn to use your Bind-It-All or practice with it some more!!! Nancy took such a sweet picture of this for their site, I decided it should go up here for all of you to see. This is the results of just 3 colors of Alcohol Inks and some Fragments. Not too shabby!!!! Although I have many more colors, this was done with Eggplant, Cranberry and Lettuce. I MAY have thrown a little bit of Rust in on the center one.....I've slept a lot since then! 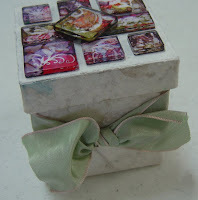 The box is covered with handmade papers and tied with ribbon. The class book is on Aug 22nd blog entry....take a look! Back to Doing What I Like Best!!! This is what I love to do....Vintage Collage. I had this wonderful gal in my metal class in St. Louis, Jane, who came up with this terrific idea of using the long Fragment piece like a window with people in it. So here I used a frame as a mold with the Chocolate Brown metal from Ten Seconds Studio, and the children are from Collections. The word and strip at the bottom are also from Collections. I just drool over the papers from Graphic 45. EVERYTHING she has is to die for.This is Garden Suite from the Botanicabella Collection. The base is a Maya Road chipboard tag. Then I added a word tag and arrow from Tim's stuff, a couple of buttons, some rick-rack and ribbons, and of course white pen marks. TA DA! Go create something you love! It's all about Friends in ART! And here is a new friend I met at CHA after corresponding for a bit. IS SHE TALENTED OR WHAT!!!!!!! This unbelievably beautiful gift arrived at my home from Linda Brown of LB Crafts in England. She is a lover of Ten Seconds Studio metal and tools as am I. "For the little bit of copper embedded in the UTEE, it has black paint dabber on it. Then the rest is painted with those paints and wax from Terra Bella. Basically, I use their white peasant acrylic paint as a carrier, then add a drop of their pure pigments to custom mix my own colours. When it’s dry add some wax and.....hey presto!" Her skillful talent is shown here in the wonderful detail. Remember what I told you girls in St. Louis....."it just takes a bit of practice!" And this shows in Linda's work. Thanks so much for the gift and the permission to post it. The Gals of St. Louis at For Keeps Sake!!!!! We live to tell about it!!!! HA! Forty-seven students in 2 classes. And to me, they were all worth their weight in gold! I loved them all, but my new personal hero...or heroine... is Delores. She has more tenacity in her hands and heart than I can only EVER hope to have. She made me really see things in a whole new light, and for that I will always think of her when I feel I can't do something. I gave her the "smarter than the teacher award" after she kindly brought to my attention that I wanted her to do something backwards. Yeah, I was trying to help her! But they all take care of each other, and help one another, so that everyone can have a great time. AND WE DID!!!! We gave away all kinds of door prizes and 2 grand prizes were drawn from the many who signed up for ALL 4 CLASSES! These are a couple pictures of Wendy teaching. She took pics of completed books.....by Sunday at 5 we were so wiped out, I didn't get pictures of the books from my class. But most proudly wore their necklaces from the Saturday class and they were ALL fabulous!!! They outdid themselves with creativity, and that's what it's all about. Thinking "out of the limits" of the instructions, and just going your own way. Did Someone Say DOOR PRIZE???? Do you think we should have this as a door prize for one of the classes this weekend at For Keeps Sakes???? These Hero Arts flower jewels were just the right color and size to add to this slider tin necklace. There are only a couple of spots left in the jewelry class.....and this is a technique you will be learning!!!! !